Many among the thousands gathered before Maduro are cadres from Venezuela’s socialist party, brought by bus into the country’s capital of Caracas for yet another choreographed rally in support of their beleaguered president. Some belong to a small minority who still genuinely support him. More than 50 nations, including the United States and most of Latin America, concluded that Maduro’s re-election last year was a fraud. They have recognized Juan Guaidó, president of the opposition-led National Assembly, as Venezuela’s legitimate head of state, endorsing his mission to establish a transitional government and hold fresh elections. Washington has imposed oil sanctions that deprive Maduro’s government of a large part of the hard currency revenues upon which it depends for most of its income. Maduro’s adversaries had hoped for success by now. They are beginning to ask what else they and their international supporters need to do to topple him. “I am trained for that,” says Mejía. “However, I am not trained to take up arms and fight against a trained army. No one doubts that Maduro would fall if the men in charge of Venezuela’s armed forces withdraw their support. Some heavy hitters on the world stage continue to back him — notably China, Iran, Turkey and Russia. This weekend, Russia flew two planes to Caracas, reportedly carrying Russian military personnel and supplies. The U.S. State Department condemned the deployment as a “reckless escalation of the situation,” Reuters reported. Fractures have appeared in the lower ranks. These grew markedly after an opposition attempt on Feb. 23 to deliver 280 tons of humanitarian aid, much of which the U.S. parked on the Colombian border, hoping Venezuela’s security forces would disobey orders to block it. That effort failed, but according to Colombia’s Foreign Ministry, about 1,000 Venezuelan police and soldiers have recently crossed the border and handed over their weapons. Yet Venezuela’s military high command has remained loyal, despite Guaidó’s offer of amnesty to armed forces that abandon the government. 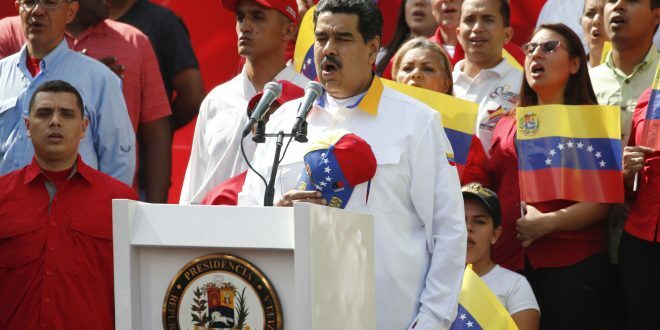 Maduro’s opponents explain the continued support by saying senior army commanders pocket millions from illicit black-market activities, including food and currency rackets and narcotics and gold smuggling. Venezuelans also frequently attribute their generals’ dogged loyalty to the role played by Cuba, Maduro’s closest foreign friend. “I believe [the Cubans] are the real power in Venezuela right now,” says José Toro Hardy, an economist and oil expert who is advising Guaidó’s team on transition, should he assume power. The National Assembly voted to block the government’s long-running shipments of heavily discounted oil to Cuba, in the hope this will encourage the Cubans to withdraw their spies. But the state-run oil company is not expected to abide. As Guaidó’s U.S.-backed campaign to assume power enters its third month, Maduro appears to be stepping up the use of force against his opponents. Last week, agents from Venezuela’s intelligence service raided the home of one of Guaidó’s closest aides, a lawyer named Roberto Marrero, and detained him. Maduro’s information minister, Jorge Rodríguez, is accusing Marrero of being part of a “terrorist network” planning to assassinate the leaders of the Bolivarian revolution — a claim dismissed as nonsense by the opposition and its allies. Maduro and his government are “surviving through terror because they want to maintain a narcostate,” says Jaime, 45, an accountant who spoke to NPR inside a multistory parking garage to avoid being seen by the authorities. Like many Venezuelans, he declines to give his full name for fear of reprisals. 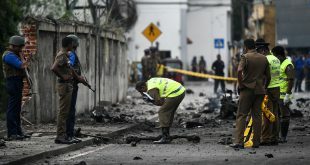 After Venezuela’s huge power outage, Maduro called for the mobilization of colectivos, an armed pro-government motorcycle militia with a reputation for using extreme violence. 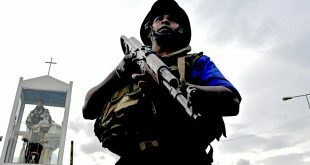 Many Venezuelans feel the same about other security forces: Thirty-seven people were reported killed in Caracas during house raids in January by the national police’s special force, according to United Nations High Commissioner for Human Rights Michelle Bachelet. “I am a communist since I was in my mother’s womb,” says Alejandro, 65, a retired member of Venezuela’s National Guard who is among Maduro’s dwindling band of supporters. Many Venezuelans believe — and often hope — the U.S. will lead a military intervention that will finally drive out Maduro. That conviction is reinforced by the Trump administration and Guaidó: Both regularly emphasize that “all options are on the table.” Yet the idea is widely opposed in the international arena, and there is little sign of enthusiasm for it in Washington. If you press him about why he still supports Maduro, despite his nation’s economic catastrophe, Alejandro concedes that Venezuela “has problems.” But, he says, “Nicolás will continue, because it is his mission. Maduro’s hard-core support is small: just 14 percent, according to a February survey by the Caracas-based polling company Datanalisis. Guaidó scored 61 percent. The oil sanctions the U.S. imposed on Venezuela in late January are making an impact. With the world’s largest proven oil reserves, Venezuela’s production dropped by 142,000 barrels per day from January to February, according to OPEC. That is far below Venezuela’s output from a few years ago. The industry’s infrastructure is falling apart; many thousands of engineers have left; the state-run oil company finds it increasingly difficult to import diluents needed to raise Venezuelan crude to export grade. The Maduro government is scrambling to find fresh clients for crude oil that it is no longer exporting to the U.S. The fact that Maduro has survived thus far is a “complete mystery,” says Toro Hardy, the economist and oil expert. “Maduro is like a plane without fuel. He cannot fly anymore. … Unfortunately we, the Venezuelans, are all passengers on that plane,” he says. Despite this, it is far from certain Maduro will fall. That concerns rights groups, which fear U.S. sanctions are deepening the hardship of a long-suffering population and weakening their ability to organize against Maduro’s government. Next Why Hasn’t The Gig Economy Killed Traditional Work?